Meritide led the development of a robust contract approval management system for Carver County that incorporated underutilized capabilities of SharePoint 2010. Our solution provided a streamlined, highly visible, personalized, and auditable contract approval process. A key component of County business operations is the vendor contract approval and management process. This process requires contract originators in the County’s 11 divisions and 45 departments to 1.) gather required documents including statements of work, grant requests, insurance and financial information, 2.) submit these documents to County risk managers and attorneys for review, 3.) receive approval from department and division leadership, and 4.) if required, schedule time at County board meetings for final approval. Prior to migrating this process to SharePoint, approximately 350 contracts per year were managed using a combination of Excel spreadsheets, a printed form cover page, and manual document routing and approval through printed documents, email notification and email attachments. Although this process adequately allowed contract originators to conduct due diligence and follow County process, there was an identified opportunity to streamline the process using many out-of-box SharePoint 2010 capabilities. The project to develop a Contract Approval Management System was contracted to Meritide who proposed the system could be developed using underutilized out-of-box features of SharePoint 2010 enterprise, and then only using custom development when required.The goal of this approach was to leave the County with a system that they could manage, upgrade, and expand without requiring the development contractor’s involvement. Meritide leveraged the County’s existing project managers, business users, and SharePoint administrator to design a system right-sized to business requirements, was not over-complicated nor based on custom proprietary code. The project was structured to follow an iterative process and introduce new features through each iteration. This process allowed basic capabilities to be demonstrated and tested early where each iteration introduced more sophistication and SharePoint features to deliver the required capabilities.A key benefit was that end users and business sponsors could see continual progress, understand design decisions, and tweak the design as it was being implemented based on demonstrations and live working sessions. Introduced an electronic “Contract Folder” that collected contract data including vendor information, approval requirements, and financial instructions – allowing all contract-related documents to be organized and routed together. Leveraged the existing SharePoint interface so users would could adopt and use the system. Utilized out-of-box document, workflow, metadata, and list capabilities with minimal code additions or proprietary customizations to provide a system that existing county SharePoint staff could maintain. Supported role-based interface personalization so users only saw details related to their role: contract originator, reviewer, or approver. Reduced email routing and notification by providing color coded status dashboards to all of those involved in the process. Captured the user, date and time, and comments throughout the approval process that could be used for process audit while communicating changes between approvers and reviewers. Left behind rules, views, workflows, and email templates that County staff can modify and extend as needed. Document Set content type to organize a contract ‘folder’ that had contract and vendor metadata and included content types for each of the contract documents. Managed metadata lists to organize the metadata related to Vendors, Departments, and Contract Types. SharePoint Designer workflow for submission, contract number assignment, approval, and routing of the documents through a three-step approval process. Faceted metadata filters to allow views to be filtered by vendor, contract type, and department and provide search capabilities once contracts are completed or archived. Audiences and Views to tailor the site’s look and feel to match the role of the user (contract originator, risk evaluator, attorney approver, division approver). The use of these features combined with an application view of business requirements delivered significantly more capabilities than a simple document library or collaboration site: it provided a tailored business solution driven by business rules to ensure adherence to a defined process. In addition to providing the core Contract Approval Management application using SharePoint, the system was integrated to two external processes and systems: an existing Board Action Request SharePoint site, and OnBase. The County had an existing SharePoint site to manage Board Action requests, with requests originating from an InfoPath form. 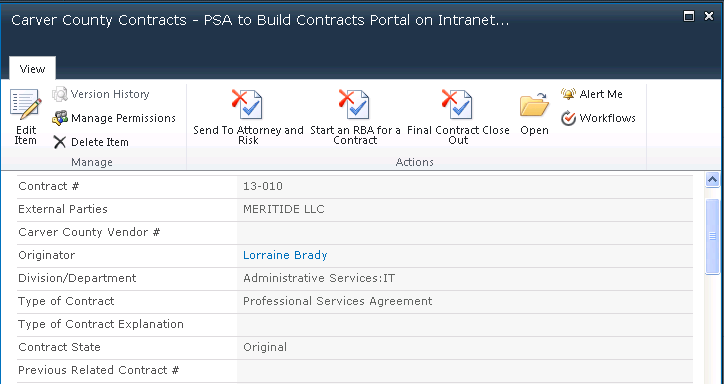 The InfoPath form contained required fields for a board action request to be submitted, many of which also existed in the new contract approval management solution. By utilizing the built-in Content Retention capabilities of SharePoint 2010 Enterprise, a workflow was designed to package contract information as an InfoPath form and submit it (across site collections) to the existing Board Action site as a new request. This eliminated the need to copy/paste or retype the information into a new form with the added benefit of being able to create cross-reference links between sites – making it easy to review the contract from the Board Action site. Another integration was provided to an existing OnBase document scanning and archiving solution. This system was already being used to house completed, signed, and scanned copies of all the contract materials. OnBase was the system of record for archiving all contract documents. A workflow was developed to run once the scanning process was complete in OnBase. The workflow provided a link from the Contract within SharePoint directly to the scanned documents in OnBase, allowing users to quickly view final signed and scanned versions of documents. This capability was integral to the process of amending and renewing contracts, or reviewing official signed versions of contracts including the iterations and workflow comments generated during the initial approval process. The SharePoint-based contract approval management solution helps users understand their role in the process, facilitates quick response from approvers and reviewers, and provides constant communication and status to everyone involved including department and County leadership. The application was well-received at all levels of the organization. For users, the application streamlines the process and allows work to be done in parallel rather than linearly through the use of workflows and status dashboards. For approvers and leadership, the application provides a way to quickly assess where individual contracts are in the process or if a backlog is developing. Approvers can act on open items based on priority, and the application provides the entire organization with a complete process picture. The County SharePoint staff involved in the project were left with an improved understanding of SharePoint’s capabilities and are able to maintain or extend the solution without proprietary help or code of an external vendor. The initial deployment was regarded as a “Phase I” with intentional room for continued process improvement. Future phases of the project will most likely incorporate the use of document barcoding and metadata to enhance the scanning of wet signed documents, as well as the introduction of electronic signatures on documents for internal signers and external vendor contracts. The County is also considering integrations with other systems such as financial and vendor management applications. Carver County is one of the fastest growing Counties in the state of Minnesota, located just southwest of the Twin Cities, and offers the ideal combination of a picturesque natural setting and attractive professional opportunities. Meritide’s mission is to provide our clients with design, integration and implementation services targeted to deliver optimal system performance, realize cost savings and drive competitive advantage. Create your own success story with us today! Meritide has been providing trusted business consulting and IT services since 1999. Meritide has been providing trusted CIO, IT and management consulting services since 1999. Our mission is to help our clients apply business process and technology to their business – appropriately.